Apologies for the redundant threads here in Music Tech DIY, but I've got a lot of TR-909 clone stuff coming out now that vcNOIZ is wrapping up and I feel they all deserve their own thread! This is identical to the original 909 clap, other than having 3 added controls you will not find on any TR-909! These three controls let you warp and mangle the clap sound and shape it the way you like. The original design has NO control over the sound other than volume control! Re:Synthesis will of course offer eurorack (and maybe other) panels for it like with all my projects! interested. Probably just 1 for me. One of these too. Awesome! It might be interesting to add the few components needed to clone the TR-808 analogue noise source as an alternate noise source (as there are a lot of similarities between both clap circuits). The "clap" part is pretty much identical, the "reverb" somewhat different. BA662A is used for both I think, which is impossible to get, but BA6110 is nearly identical (different pinout) and quite easy to find (I have a bunch sitting here). I think a 2SA798 was used in the original (on the schematic I can't see what Q38 is, but it looks the same as the matched pair in the hi-hat circuit). TR-808 used a (presumably hand-matched) pair of discrete transistors, so I guess this isn't critical. 2SA798 are like hen's teeth due to their use in x0xbox. i'm putting my hand up ! Great ideas of course! But, in all honesty, I think it's a lot easier to spend $7 on the NTE4006 replacements which Mouser stocks, or, if you're really cheap order a couple off eBay for $3 or whatever. The CD4006 are really easy to find! 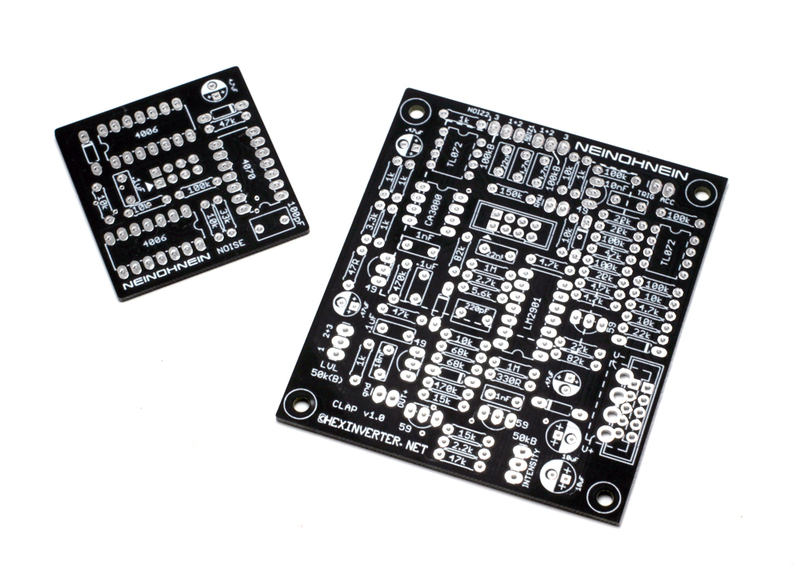 Adding more parts to the PCB means a larger, less euro friendly board and also increases the PCB cost to everyone as a direct result of larger area used...so, I don't think alternate parts are really worthwhile in this case. If the CD4006 used in the noise generator was a bit more uncommon I'd definitely consider it. ALSO -- if you have built any one of my NeinOhNein modules which use the noise source (kick, snare and now clap) you just chain them together and they can all share one noise source! Cool, I'll grab one it you make a panel for it that says "the clap". Yes, one for me, please. Oh good, it uses a 798. I've got three of those I had to buy as a set with the 1583s I got for the Miss10 oscillators. They're pulls and have cut leads and I haven't tested them beyond making sure the pinout is the same as the original. Regarding the BA662A; that's also used in the XOXboxes and is ludicrously scarce as a result.